Tropical Dreams is licensed and insured, and has earned the trust and confidence of decades-long business and residential customers throughout metro Phoenix. We are known for careful attention to detail. When is the last time your aquarium maintenance service performed a water change? Tropical Dreams provides everything required to keep your aquarium beautiful and healthy. These services include water testing, water and filter changes, decorative plants or coral cleaning and aquarium cleaning inside and out. A 30-to-50% water change should be done every four weeks. The water change dilutes food and waste build-up. Without frequent water changes, the aquarium environment becomes toxic and stale. We also vacuum food and waste from the bottom of the tank. Our goal is to keep your fish healthy and flourishing. Many of the fish in our care live for decades in both saltwater and freshwater tanks. New fish are covered by our Livestock Free Replacement policy for the first 90 days. aquarium location; business or home; size; saltwater or freshwater; existing filtration type; number of monthly service calls; accessibility and water outlet locations. Our itemized invoices detail materials, services, feed, etc., so customers always know what the charges are. We offer honest, quality services at a fair price. Don't be fooled by someone quoting Flat Fee service plans. Call us at 480-752-3474. Service requirements vary with each customer. 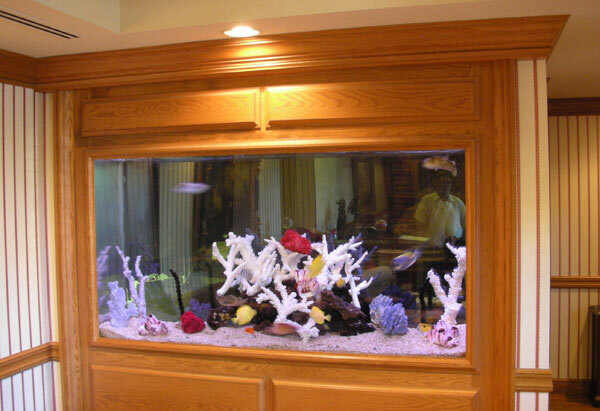 An aquarium placed in a professional office with many windows may require weekly service. The same aquarium placed in a residential location with few windows may only require monthly service. Regular service visits are scheduled weekly, bi-weekly or monthly for all aquariums. We often find that existing aquariums are incorrectly installed and usually need some form of modification to operate correctly. If you are having problems with your aquarium, call us for a consultation. 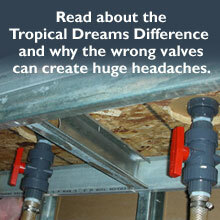 Recommended corrective measures by Tropical Dreams are 100% guaranteed. Integrity and honesty are the cornerstones of our philosophy. We service aquariums in the east valley; specifically, Tempe, Mesa, Scottsdale, Chandler, Gilbert, Ahwatukee and the surrounding Phoenix area.